Klondike Gold Corp. has completed drilling 5,365m of drilling in 71 holes this summer at the Lone Star property. Assays pending… I assume this will make or break the project for them, but what do I know? Pacific Ridge intends to raise $300,000 to stay alive, and they also plan to spend it in BC, not Yukon… They farmed out their previous flagship Mariposa project (in the Yukon) to a private company. Golden Predator has found a new big juicy gold in soil anomaly 7km northwest of the main 3 Aces area. Of note, they are drilling PQ sized core holes this year – huge diameter! 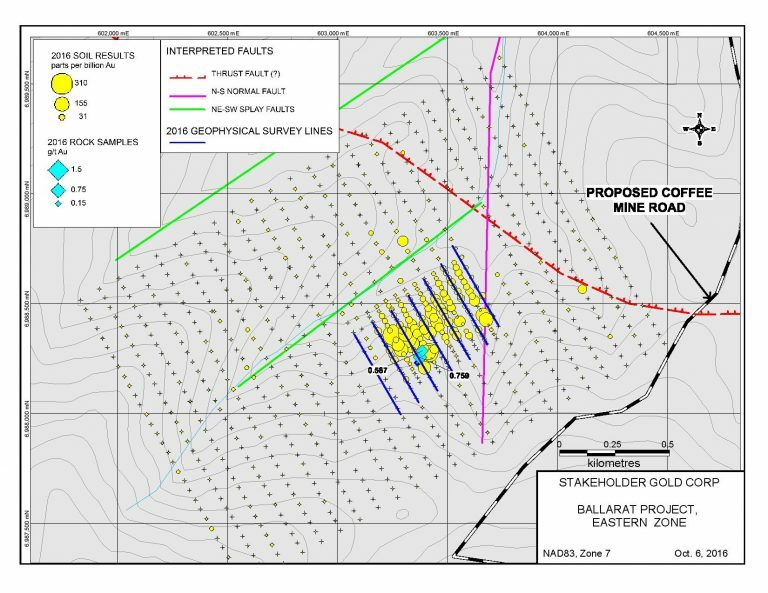 Stakeholder Gold is doing RAB drilling on their Ballarat property in the White Gold area… Note proximity to the proposed Coffee project road. This entry was posted in News & rumours, Northern news. Bookmark the permalink.